In a generation of Irish playwrights who achieved international recognition by chronicling a country in rapid, often convulsive, transition from centuries-old entrenchment to a Celtic Tiger-economy in waiting, Tom Murphy was the one least persuaded by the notion of progress and most concerned with the immediate consequences of its belated but precipitous arrival. As Ireland moved towards modernity and the reclaiming of its diaspora driven away by decades of famine, poverty and a suffocating intertwining of religion and state, Murphy was, said the Irish president, Michael D Higgins, in tribute, “above all the great playwright of the emigrant, more than anyone capturing, in a poignant, creative way, the transience that is at the heart of the emigrant experience”. Born in Tuam, County Galway, the youngest of 10 children, Murphy began writing while a metalwork teacher. After failing to get his first one-act play, On the Outside (co-written with Noel O’Donoghue in 1959), produced in Ireland, he left home for London. When his first full-length play, A Whistle in the Dark, was also rejected by Dublin’s Abbey Theatre, it was picked up by Joan Littlewood at London’s Theatre Royal Stratford East in 1961. Introducing what would become career-long tropes – the pressure-cooker violence of Irish masculinity, the experience of the reluctant emigrant, the friction between past and present, waxing secularism and waning religion – it was characteristically provocative, its mundane, dyspeptic domesticity underpinned and illuminated by a muscular sense of poetry. At the end of the 1960s, The White House revisited the wound of forced emigration as a former exile returns home to find that time and attitudes have moved faster in his adopted America than his native Ireland. Reworked as Conversations on a Homecoming, it was later seen at London’s Donmar Warehouse in 1987. Murphy’s plays continued to address the preoccupations of the contemporary Irish psyche, conspicuously so in 1968’s Famine, a thoughtful but passionate interrogation of the central, defining trauma in recent Irish history. Eschewing his previous emphasis on often caustic realism, he began experimenting with form and fantasy in A Crucial Week in the Life of a Grocer’s Assistant (1969) and The Morning After Optimism (1971). By the middle of the 1970s, a change of management at the Abbey Theatre led to his appointment to its board and a rising profile on its stage. The Sanctuary Lamp controversially locked antlers with religion in 1975. Taken aback by the rancour that greeted its premiere, Murphy all but abandoned writing to become an unsuccessful market gardener. His return to the theatre, 1983’s The Gigli Concert – in which a depressed Irish millionaire businessman seeks the help of a quack English psychiatrist to help him sing like Beniamino Gigli – proved to be his most revived play, yet it took almost a decade to reach London at the Almeida Theatre in 1992. Seen at the Donmar Warehouse in 1986, Druid Theatre’s Bailegangaire, a memory play about a traditional laughing festival (the title translating ironically as “Town Without Laughter”), featured Siobhan McKenna in her last appearance on stage. Too Late for Logic (1989), describing the four days leading up to the suicide of a seemingly successful philosopher, and The Patriot Game (1991) – a documentary-drama written for the BBC in 1965 but never broadcast, depicting actors rehearsing scenes from a history of the 1916 Easter Rising – were articulate interrogations of the still current social, religious and political preoccupations of Ireland. Later plays included She Stoops to Folly (1996) – a reworking of Oliver Goldsmith’s The Vicar of Wakefield – and The Wake (1997), an examination of the sour undercurrents emerging in an economically ascendant Ireland viewed through the prism of one of its most hallowed traditions. Murphy returned to the emigrant experience in the 1950s-set The House (2000) in which nostalgia and hindsight memorably clashed. Performed at London’s Royal Court Theatre in 2005, Alice Trilogy featured a riveting performance from Juliet Stevenson as a woman reliving a life of missed opportunities and deadening drudgery. It was, in many regards, Murphy’s most acidic and penetrating yet subtle comment on Ireland’s recent history. 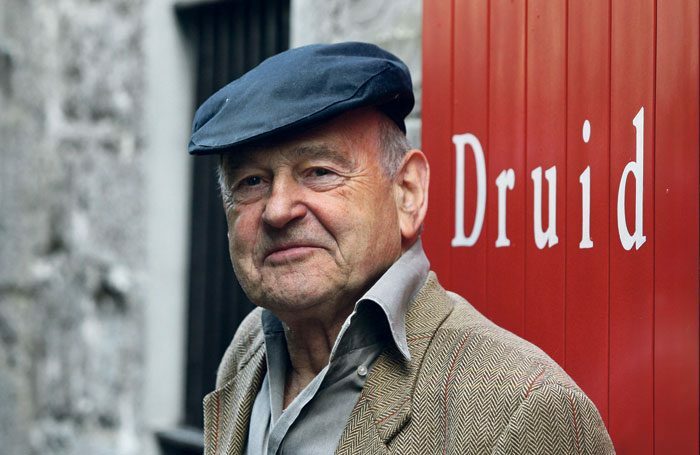 Murphy’s plays were the focus of season-long retro­spectives by the Abbey Theatre (2001) and Druid Theatre (with whom he was writer in residence in 1983 and enjoyed a long relationship) in 2013-14. In 2017, he was a recipient of the Gold Torc, the highest honour of the association of elite Irish artists Aosdana. He published a novel, The Seduction of Morality, in 1994. Thomas Bernard Murphy was born on February 23, 1935, and died on May 15, aged 83. He is survived by his second wife, the actor Jane Brennan, and three children from his first marriage. The Green Room: What’s your experience of understudying?